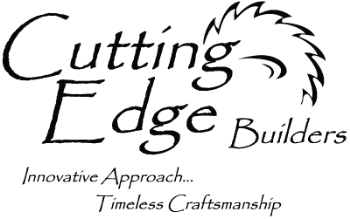 Worried you’re leaving something special out of your kitchen remodel? Consider these four design details to delineate space, increase light and otherwise enhance the room. Homeowners’ requests: Open up the closed-off kitchen that connected to the rest of the 600-square-foot condo only by way of a small pass-through window; replace old bulky appliances with new compact ones, and use deep drawers and a large island for more efficient storage. Special feature: A Calacatta marble backsplash extends to cover an entire wall, defining the kitchen area from the adjacent dining and living spaces. “It acts as a beautiful backdrop to the workspace of the kitchen, and adds natural texture and beauty to the entire open living area,” says interior designer Lauren Webb. Plan of attack: First came removing walls and rerouting plumbing and electrical work. Then Webb chose a tall and narrow counter-depth refrigerator. From there, she sought to maximize drawer space. An electric cooktop and wall oven combination takes the place of a slide-in range for a more streamlined look that allowed the countertop to extend the entire length of the back wall. Gray countertops blend with the black cooktop. A high-gloss white bar face provides visual division between it and the natural white oak floor, and creates a stunning backdrop for custom-made solid white oak barstools. Why the design works: Opening the kitchen made the space feel larger but not defined. The marble tile helps designate spaces. 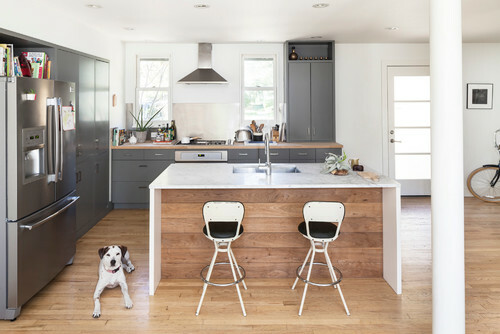 What goes on here: This is a kitchen designed for a 29-year-old carpenter, his 27-year-old girlfriend and their two dogs. The kitchen and dining area provide a strong home base to spend time with each other away from their busy life. 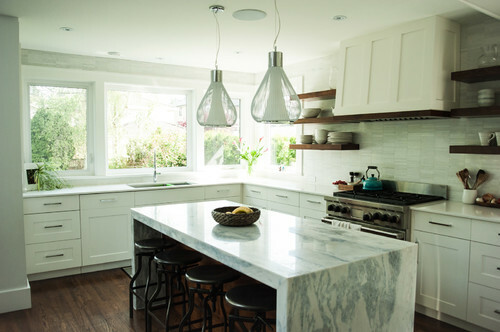 Splurges and savings: The floor-to-ceiling marble backsplash was a splurge. Savings came from using Kitchen Craft for the millwork. Homeowners’ request: Preserve the historic integrity of the house while providing necessary space and amenities for modern living. Special feature: A Dutch door gives the homeowners the ability to open just the top portion to preserve privacy while letting in cool breezes and the sounds of their three young children playing in the backyard. 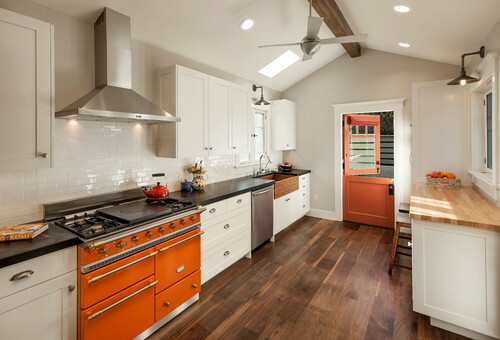 The paint color (Mandarin by Sherwin-Williams) was chosen to match the Lacanche range. Plan of attack: When the current owners purchased the 1,085-square-foot one-bedroom, one-bathroom house, originally built in 1919, it was in horrible condition. A century of runoff from the adjacent street and uphill parcels, poor drainage, and no waterproofing left the northern wall completely rotten. But the building’s condition wasn’t just due to age. The previous owner started and then abandoned a poorly executed remodel, leaving the house open to the elements for two years. The new owners loved the character of their Bungalow Haven neighborhood, its walking distance to downtown and its proximity to good schools. Their goals were to bring back Craftsman features lost over time, convert the former basement into additional living space (adding 480 square feet), and improve the home’s comfort, health and efficiency. Every inch of the house was touched to meet these goals. Why the design works: While the overall house footprint is relatively compact, the public areas flow into one another to create a generous feeling. The lower-level addition created bedroom, bathroom and laundry spaces that relieve the upstairs from having to do too much. Significant storage areas in the attic and lower-level crawl space support family-living needs. Who uses it: A young couple with three small children. Homeowners’ requests: Fix a cramped galley layout so narrow that two people couldn’t pass each other; bring more natural light to the north-facing space. Special feature: Light-colored marble countertops bounce natural light around, while walnut on the island and shelves helps warm the space. Plan of attack: “The first piece of the puzzle is always a beautiful piece of stone,” says designer Laurel Miles. “In this case, a gentle blue, white and gray marble called Namibian Sky.” A fresh transitional style drove the decisions, with Miles being careful not to let things clash with the age of the home. 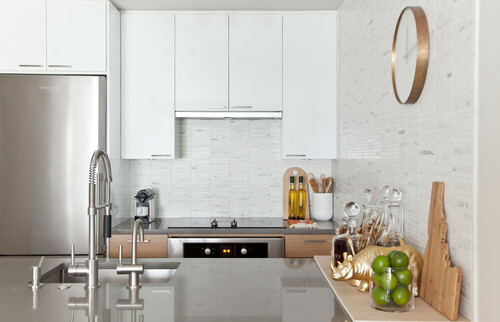 A mosaic of white quartz, cut in a nontraditional horizontal shape, forms the backsplash. Who uses it: Three active school-age children and their busy professional parents. “Uh-oh” moment: “We were trying to come up with a scheme to get more space into the kitchen to serve all the many purposes and people of this multifunctional space, and the rear yard setback was really limiting our options,” Miles says. “After many attempts to reconfigure the plan to get what we wanted, it occurred to me that because we were already going to lift the house to replace the very old original foundation, it wouldn’t be much more work to roll the house forward. Homeowners’ request: A better connection to the outdoors with an open kitchen, dining and living area that opens to the backyard. Special feature: Dime-gap cedar boards inset in the island create a durable surface for footmarks caused by people sitting on the stools. 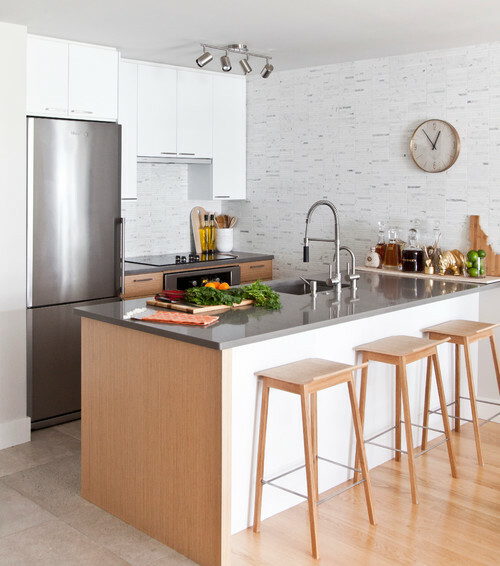 “We also wanted to bring some natural elements to a kitchen that was dominated by gray paint and stainless steel appliances and fixtures,” says designer Nana Kim. Why the design works: It prevents scuff marks and warms the Carrara marble countertops and white-gray paint. Who uses it: A printmaker and graphic producer and their two boys, one in junior high school and the other in high school.